I have the hugest playwriting crush on Stephen Adly Guirgis. Back when I was writing under the pseudonym “critickate,” I wrote a post detailing all the reasons why I love his plays. Despite my admiration for his work, I had never seen one of his plays live. Atlantic Theater Company’s production of Guirgis’ new play Between Riverside and Crazy is now playing at the Linda Gross Theater, and I got to hear Guirgis’ dialogue on stage for the first time. Between Riverside and Crazy has your standard Guirgis elements: New York City setting? Check. Diverse cast of characters? Double check. Shady goings on? You know it. Dramatic moments punctuated by diaphragm-ruining comedy? Oh, yes. 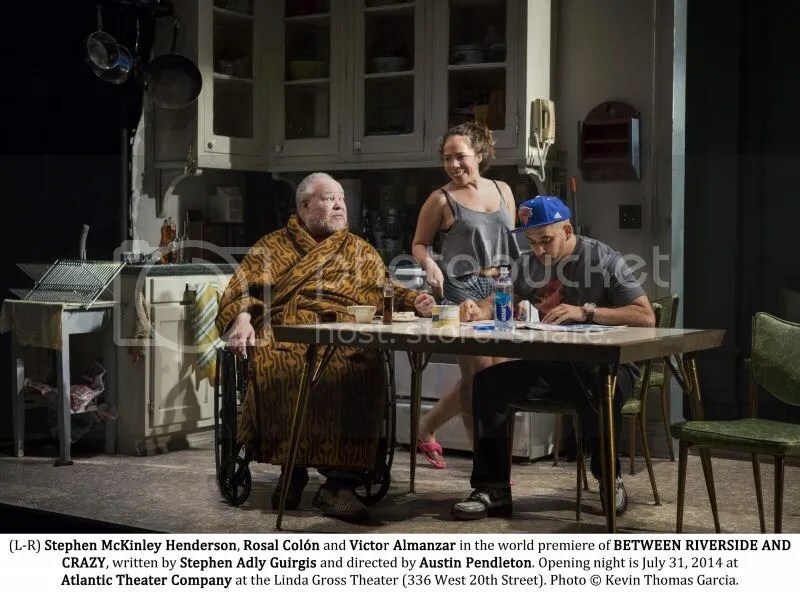 Its focus is Walter “Pops” Washington (Stephen McKinley Henderson), a disabled ex-cop whose years-long lawsuit against the NYPD is endangering his rent-stabilized apartment on Riverside Drive. He shares said apartment with his son Junior (Ray Anthony Thomas), a middle-aged manchild who is illegally selling electronics out of his room; Lulu (Rosal Colón), Junior’s not-so-bright girlfriend; and Oswaldo (Victor Almanzar), Junior’s friend who is a recovering addict and needs a place to stay. As Walter interacts with his crazy housemates, his NYPD colleagues, and a meddling church lady, he tries to trade in his troubled past and present for a brighter future. Between Riverside and Crazy has many strengths. One is its cast, led by the brilliant Stephen McKinley Henderson. Walter’s character is not an easy one to play. He’s hugely imperfect, and at times, downright reprehensible. But Henderson plays the role with such nuance, humor, and joy that watching his performance is in itself a masterclass in acting. The rest of the cast also provide solid performances, from Victor Almanzar’s sincere Oswaldo to Rosal Colón’s delightfully air-headed Lulu (a far cry from her sharp character in last summer’s Basilica). Liza Colón-Zayas has a unforgettable turn as Church Lady, a character who doesn’t appear until the second act… but when she does, Walter is changed forever. Another strength is the play’s gorgeous set, designed by Walt Spangler. If you’ve been missing the revolving stage from Lincoln Center’s Act One, it has taken an Off-Broadway turn in this production, showcasing every room in Walter’s apartment in exquisite detail. The plot of the play, too, has its share of surprises. The end of the play’s first act is so explosive, it had audiences bursting into applause at the performance I attended. Unfortunately, my love is not blind. The second half, as many plays tend to do, doesn’t pack the same dramatic punch of the first half. But that is my only qualm with Between Riverside and Crazy, which is a fine addition to Stephen Adly Gurigis’ body of work. I can’t wait to see the next set of characters he’ll commit to paper, and who will bring them to the stage. Between Riverside and Crazy opens for a second run tonight! Read our review from its first run here!